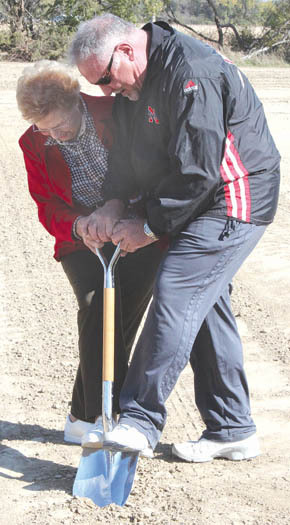 Eight weeks after announcing his plan to build a motel in Albion, Randy Christo of Walton, NE, and his mother, Jackie, turned up the first shovelful of dirt for the Cardinal Inn motel and conference center here last Friday afternoon, Oct. 25. About 35 community members attended the ground breaking ceremonies which were held at the construction site, east of the Brewed Bean on the north side of Highways 39-14. The general contractor, Ryan Belgum of Hickman, will begin construction this week on the 25-room motel and conference center. Subcontractors will include several firms with ties to the Albion area, Christo said. Details in the Oct. 30 Albion News Print & E-Editions.